If you are looking for a picture book about hermit crabs, probably you will end up with A House for a Hermit Crab, by Eric Carle (Simon and Schuster, 1991). This is a fine book in many ways (I like it, my children like it, people all over the country like it) but as far as science goes, I can't help but thing that Carle has vaguely confused decorator crabs with hermit crabs--the titular crab wanders through a year, gathering both new companions and new living accouterments for his shell. Unlikely behaviour for a hermit crab (hence the name?). And although Carle's illustrations are artistically admirable, they aren't a reliable guide to real life creatures. Here are two hermit crab picture books that do the subject more naturalistic justice. 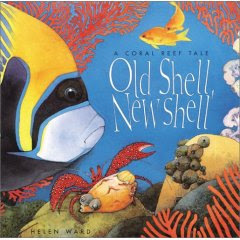 The first is Old Shell, New Shell: a Coral Reef Tale, by Helen Ward (Millbrook Press, 2002). though he tried hard not to." The illustrations are full of lovely lifelike detail, and there are lots of things to spot on every page. A very pleasing book. But here is the book that I think is the Best Hermit Crab Book Ever-- Hermit Crab's Home: Safe In a Shell, by Janet Halfman, illustrated by Bob Dacey and Debra Bandelin (2007, Smithsonian Institution). In both the two books above, we start in medias res, with the outgrowing of the old shell. Hermit Crab's Home begins at the beginning, with the tiny egg of a Land Hermit Crab tossed onto seashore rocks. It follows the hermit crab through the adventures of life as a hermit crab on land, including the obligatory finding a new shell episode (in her case, it comes from a sandcastle). And it ends with the crab casting her own eggs into the water. One reason I liked this book so much is that the pictures are up close and low down--the world as a crab might see it. The menacing ghost crab looming above is quite spooky, the sand castle quite magical. I found the straight forward narrative of the crab's life more interesting than the more stylized renditions of the other two authors. It's more a story. Maybe the book even appealed so much to me because the crab protagonist is female. But maybe not--it also appealed to my boys! Here are more Nonfiction Monday reviews, at Picture Book of the Day.